← Comfortable ‘marble’ chair carved out of… silk? Nothing like a bit of interior design inspiration for those dreadful Monday blues. When, in 1793, the guillotine cut off his head, he probably had no idea how his legacy would live on in furniture. Trends come and go, but the style named after this notorious French King, is always in fashion. Here’s a couple Louis XVI inspired interiors to feast your eyes on. 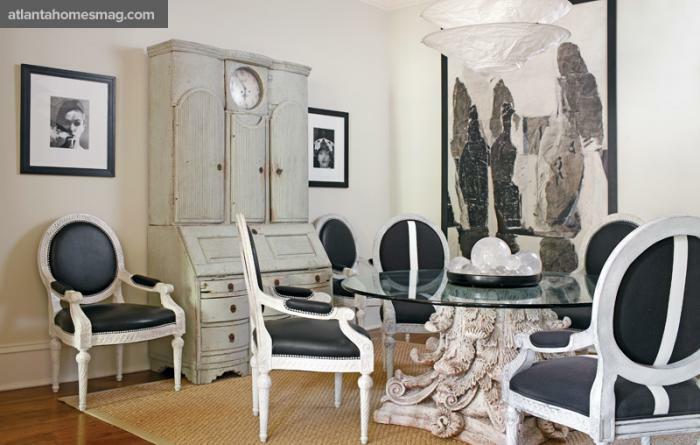 I love how in this case, Louis XVI style chairs are mixed with quintessential 1970’s elements. A lovely classic interior with a minimalist twist. I love the Yves Klein-esque blue flower fabric on the chairs! The Starck chairs are almost as old as Louis himself would’ve been, but they work really well in this bright ensemble! In my humble opinion, the armoire in this design is a wrong choice. I would’ve gone for a darker natural wood, or maybe even glass. This looks to ‘Brocantish’. This entry was posted in General living and fun stuff and tagged design inspiration, ideas, inspiration, Interior Design, Louis XVI, louis xvi style, moodboard, Tips. Bookmark the permalink.